NEW DELHI (Thomson Reuters Foundation) - Hundreds of deaths caused by an extreme heat wave in India could have been prevented if authorities followed the example set by Ahmedabad which introduced measures such as cooling spaces to protect citizens from the rising mercury, climate experts said. At least 1,300 people have died in northern and southern India over the past week, with temperatures over 46 Celsius (114 Fahrenheit) baking states such as Andhra Pradesh and Telangana as well as the capital New Delhi. Doctors' leave has been canceled to help cope with the sick flooding into hospitals and clinics, complaining of headaches, dizziness and fever. Most of the deaths have been of construction workers, homeless people and the elderly. But with the threat of more frequent heatwaves as a result of climate change, experts say India must recognize rising temperatures as a natural disaster, just like floods or earthquakes, and have a strategy to protect vulnerable people. "The spiking temperatures underscore the need for local heat adaptation plans and early warning systems to reduce the health effects of heat stress and increase resilience in local communities to rising temperatures," said Anjali Jaiswal from the U.S.-based Natural Resources Defense Council (NRDC). "Ahmedabad's Heat Action Plan - South Asia's first early warning system against extreme heatwaves - is tailored to help protect the city's vulnerable communities during these disasters." After a heatwave hit Ahmedabad, a western city of 5.5 million people, in May 2010, killing over 1,300 people, local authorities mapped areas with "high-risk" populations including slums, as part of an action plan. They also built up public awareness of the risks of high temperatures and set up "cooling spaces" in temples, public buildings and malls in the sizzling summer months. The U.N. Intergovernmental Panel on Climate Change predicts rising global temperatures could cause an increase of up to 82 cm (32 inches) in sea levels by the late 21st century due to melting ice and the expansion of warming water, threatening coastal cities from Shanghai to San Francisco. More frequent and intense extreme weather events are also expected, putting towns and cities in disaster-prone countries like India at greater risk. 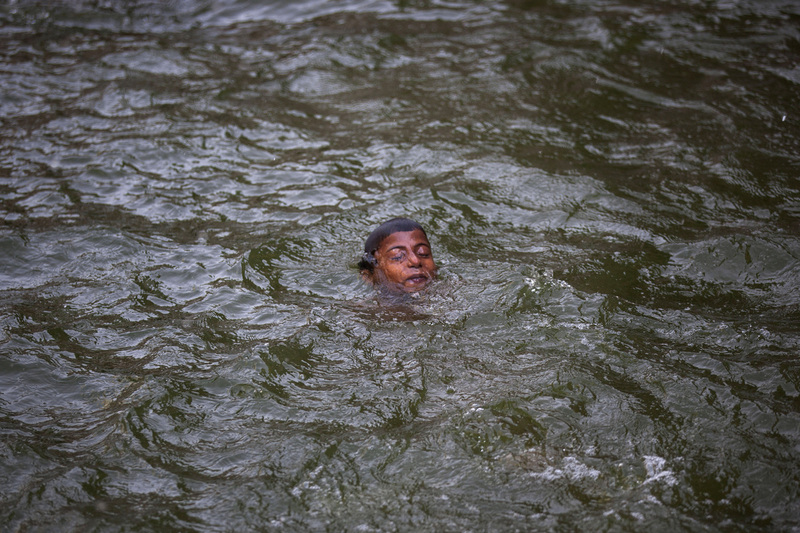 Many of India's 1.2 billion people live in areas vulnerable to floods, cyclones and droughts. While May and June are India's hottest months - with temperatures regularly pushing above 40 Celsius - meteorologists say the number of days when temperatures approach 45 Celsius has increased in the past 15 years. Temperatures on Wednesday hit 47 Celsius - six degrees above normal - in Khammam district in Telangana state where 340 people have died of sunstroke. In the neighboring state of Odisha, streets were empty, construction sites abandoned and offices half-empty during peak afternoon hours, as the mercury hit 46.5 Celsius in some parts. "The situation is horrible. It is so bad that we are not able to stay at home nor can we go out," said Debaria Bagh, 35, a cycle rickshaw driver in Titilagarh town in Odisha. Cities like New Delhi and Ahmedabad were hardest hit because of the heat reflected off paved surfaces and a lack of trees. Compared to 2010, heat waves have been shorter but killed more people, said Arjuna Srinidhi, climate change program manager at the Centre for Science and the Environment. Disaster management officials in Odisha and Andhra Pradesh said they alert the public before a heat wave and issue advice, but admit more can be done to enable cities to cope. "Since heatwaves affect a large population, you cannot move them out. I personally feel that we need to find a better way to deal with a situation like this," said a disaster official from Andhra Pradesh state, which has recorded 1,020 deaths. In Ahmedabad, authorities have focused on public awareness as the first step in preventing heat-related deaths. This includes telling people how to protect themselves via campaigns on television, radio and newspapers, as well as through messaging platforms such as WhatsApp. The basic information includes not venturing out in the afternoon, drinking lots of water and what to do if people feel dizzy or feverish. High temperatures can cause dehydration, heat exhaustion and heat stroke, and worsen chronic cardiovascular and respiratory diseases. The government also alerts residents to forecasts of very high temperatures through hospitals, community groups, media outlets and government agencies. Health workers have also been trained to recognize the symptoms of heat stress and ensure emergency rooms and ambulances are stocked with ice packs. "Similar heat adaptation plans could be adopted throughout India to combat the dangerous impacts of these scorching temperatures as other Indian cities and states express interest in replicating Ahmedabad's ground-breaking program," said Jaiswal of the NRDC. "These efforts take on greater urgency as climate change increases the intensity and frequency of heatwaves across the country and around the globe."